You've worked hard to develop your company, brand, and products. You've developed sell sheets, brochures, business cards, and maybe a catalog. Now it's time to get it in front of your prospective clients and customers. Or perhaps your department has developed a training program or orientation package that you need to deliver to your employees. What better way to professionally present your program than a custom printed presentation folder. Customized presentation folders let you present your materials in a well organized, complete package that is easy for the customer or intended target to review, store, and refer to. There are a wide range of custom finishing options available that can enhance or reinforce your brand or company identity. For an elegant, upscale look, try embossing or foil stamping your logo on the cover of the folder. Other interesting design options are die cutting a window in the cover to reveal messaging or printed materials inside. You can even bind printed pages into the folder for a mini-catalog with pockets for samples, DVDs or other inserts. Increased capacity folders can be created by adding a spine that can accommodate a larger amount of included materials. For a truly impressive sales kit you can add an additional panel to your folder that wraps over the front cover and tabs closed to become, in effect, a portfolio. Versatile design options are available to meet your marketing needs. The standard size for a presentation or pocket folder is 9 x 12 inches, but just about any custom size is possible. 6 x 9 folders and 4 x 9 folders are popular mini folder sizes, and legal size folders are commonly used in some industries. Your folders can be printed on the outside with the inside either left blank or printed. Pocket folders have pockets on one or both sides to hold and organize your other printed marketing materials. The pockets can have either horizontal or vertical business card slits or slits to hold a mini-CD or DVD on one or both pockets. Special Pantone PMS or metallic inks with a dull or gloss spot varnish or UV coating can make your folder really stand out. Get presentation folder templates and design and layout instructions to help you or your designer layout your artwork in their favorite graphic arts design program. 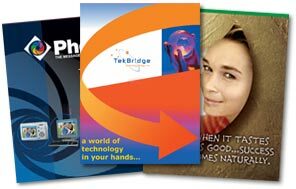 See presentation folder design examples showing printing and design ideas. Get $100 off your first Presentation Folder order! Call our helpful experts now at 800-930-2423.